With the kid’s on the Atkins Diet, I decided to make some sugar free dill pickles. A bit of this, a touch of that. A week in the fridge and voilà dill pickles. 1. 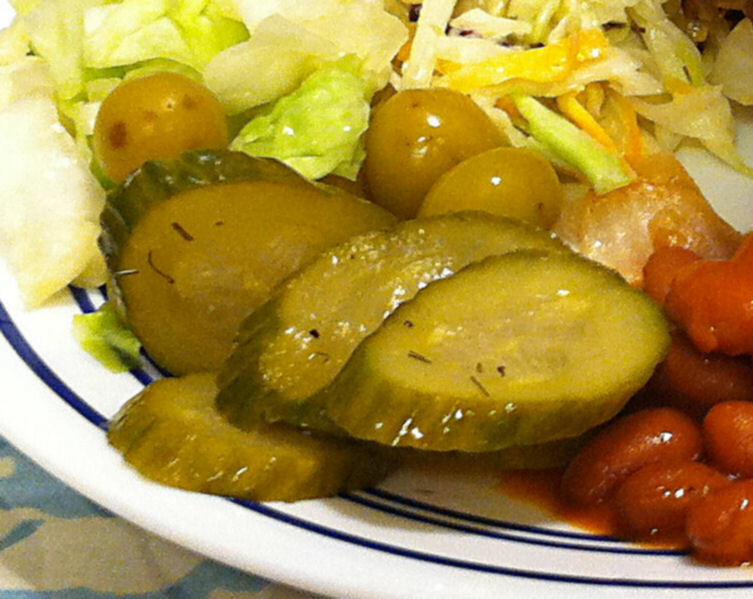 Slice the cucumbers into ¼ inch thick rounds. 2. Slice the garlic into thin coins. 3. Cut one slice from the side of a red onion and reserve it. Tip: Set the onion on its base on the cutting board, Slice down through the edge so you have a solid chunk of onion with the smaller slice layers nestled in the cup of the first layer of onion. Note: You will be using this onion slice as a cap to hold the cucumber slices down into the pickling sauce. 4. Put the cucumber and garlic slices in a quart jar. Tip: Make a layer of cucumber and then scatter a few slices of garlic over them. Repeat until the jar is full or you run out of vegetables. 5. Place the vinegar, dill, salt, celery seed, black pepper, and red chili flakes in a small pot and bring them to a boil. 6. Pour the pickling sauce into the jar and top off the jar with hot water. Tip: Fill the jar up to within ½ inch of the jar’s lip. 7. Push the cucumber slices down with the slice of onion and put the jar lid on. Tip: Place the onion slice cut side down. 8. Put the pickles in the back of the refrigerator for one week. 9. Open and enjoy within two week of opening.